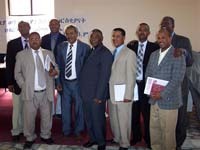 Evangelical Churches Fellowship of Ethiopia (ECFE) is an umbrella organization with a view to increase coordination of member church activities for the promotion of fellowship and cooperation in Ethiopia. ECFE’s membership has now increased to 22 denominations with 29,805 local churches and 13 million believers while 29 para-church organizations within Ethiopia and 15 Ethiopian evangelical churches in Diaspora are represented as associate members. Through a comprehensive and participatory strategic review process, ECFE developed this strategic direction document covering a period of 10 years, 2007-2016. After this introduction, Section 2 of the strategic direction discusses the history of ECFE followed by the rationale and purpose of the development of the strategic direction in section 3 and the process of the strategic direction development, under section 4. Section 5 is a summary of the strengths, limitations, opportunities and threats (SLOT) analysis made in the process. The vision, mission, core values and the strategic directions are presented under section 6. Section 7 is a presentation of strategic goals and objectives. The last section of the strategic direction discusses the implication of the strategic direction on current practices in the area of organization structure, Human Resources, finance, leadership and governance. The road map to guide the strategic direction is presented under annex I.